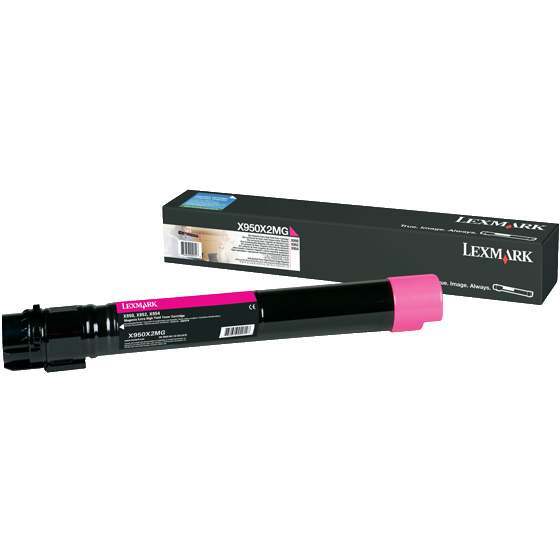 Genuine OEM Lexmark Toner Cartridge, Magenta, Extra High Capacity 22,000 page yield. Lexmark part number: X950X2MG. Color Laser Toner Cartridge compatible with Lexmark X950, X952, X954. Genuine OEM Lexmark Toner Cartridge, Cyan, Extra High Capacity 22,000 page yield. Lexmark part number: X950X2CG. Color Laser Toner Cartridge compatible with Lexmark X950, X952, X954. Genuine OEM Lexmark Toner Cartridge, Yellow, Extra High Capacity 22,000 page yield. Lexmark part number: X950X2YG. Color Laser Toner Cartridge compatible with Lexmark X950, X952, X954. Genuine OEM Lexmark Toner Cartridge, Black, Extra High Capacity 32,000 page yield. Lexmark part number: X950X2KG. Laser Toner Cartridge compatible with Lexmark X950, X952, X954. Genuine OEM Lexmark Photoconductor Unit, Black, 115,000 page yield. Lexmark part number: C950X71G. Photoconductor Unit compatible with Lexmark C950, X950, X952, X954. Genuine OEM Lexmark Photoconductor Unit Multipack, 115,000 page yield. Multipack includes: three Color photoconductor units. Lexmark part number: C950X73G. Photoconductor Unit compatible with Lexmark C950, X950, X952, X954. Qualifies for free shipping & earn 729 points! Genuine OEM Lexmark Maintenance Kit, 160,000 page yield. Lexmark part number: 40X7540. Maintenance Kit compatible with Lexmark C950, X950, X952, X954. Genuine OEM Lexmark 110V/120V Fuser Kit, 320,000 page yield. Lexmark part number: 40X7550. 110V/120V Fuser Kit compatible with Lexmark C950, X950, X952, X954. Qualifies for free shipping & earn 619 points! Genuine OEM Lexmark Waste Toner Bottle, 30,000 page yield. Lexmark part number: C950X76G. Waste Toner Bottle compatible with Lexmark C950, X950, X952, X954.